Nearly four and a half years ago, a leather-clad, blonde vigilante arrived in Starling City wielding a bo staff and a fierceness that commanded attention. Upon learning her identity as the assumed dead Sara Lance, I wasn’t sure what to expect from this young woman whose previous most defining characteristic was sleeping with her sister’s serious boyfriend. It became quickly evident that Sara was more than a breaker of the girl code. She was no longer just Laurel Lance’s little sister, just Oliver Queen’s former fling. Every scar, every brush with death and taking of a life molded her into a perfectly imperfect woman as layered and flawed and valiant as the titular hero. She became positive female representation because despite her atypical background and extraordinary fighting skills, her actions were justified with relatably human hopes and fears. The unexpected arrival of Sara’s ex-girlfriend, Nyssa, daughter of Ra’s al Ghul, Heir to the Demon, revealed her to be another type of representation several years before TV’s current bisexual boom. Within one episode, Sara was allowed to have loved Nyssa and express interest in Oliver – both attractions honest and real. The treatment of her sexuality as a non-issue, as just another facet of a woman equally as characterized by her past as an assassin, her present as a vigilante, or her future as a legend, has been a blessing and a major step forward for normalization. However, it has taken a while before we’ve seen her explore a new relationship rather than a hookup. This relationship rejuvenates the character and spreads an unequivocal message that everyone deserves a great love story. 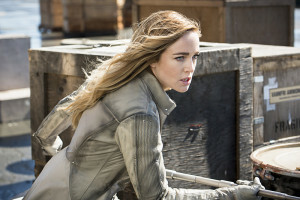 Although her storylines have not been without stumbles, Sara Lance has provided one of the most complex and fascinating looks into both female and bisexual representation while inspiring a crew of viewers to grow into their own kind of warrior. As a character, Sara receives a grand amount of praise for her physical strength, her fighting abilities, and her leadership skills. All of that praise is well deserved because I will never get over watching Caity Lotz perform an aerial while holding a sword, but Sara isn’t strong because she can complete the salmon ladder, because she knows ten different ways to kill someone with a shard of wood, or because she can intimidate her team with a single look. Sara Lance is remarkable because she questions whether this type of strength is a value worth having if it costs her her humanity. Watching Sara navigate her humanity has been the greatest joy of following her journey from Arrow to Legends of Tomorrow because it resonates so deeply. There are a million ways to continue this section. I’ve written approximately four of them, and then deleted them because none felt right and none did justice to the character. I’ve spent the past week wrestling with how personal to make this section and backing out every time because this article isn’t about me. But in some ways, it is, because isn’t that the point of representation? To both capture our internal struggle and inspire us to be more than what we are? That’s what Sara Lance does. She proves that it’s okay to have doubts and insecurities, to make mistakes, and to struggle with your purpose because life is a series of beginnings and ends – maybe not as dramatic as death and resurrection by the Lazarus Pit, but nevertheless, when one portion ends, a new opportunity emerges. You are capable of finding your way out of one unsatisfactory portion of your life and into one where you discover who you were always meant to be. Sara’s days on Arrow were marked with an undeniable sadness. Her eyes, her demeanor, her attitude radiated guilt and shame. She threw up that layer of emotional distance you keep to protect yourself and those around you because the thought of letting others see the true you scares you more than the thought of being alone. When they see you, they can judge you, and their rejection would be crushing. But barricading yourself like this only puts you on a hellish island with a population of one, and that’s no way to go through life. Sara didn’t start opening up until she became part of a team, part of a found family who accepted all of her baggage, understood her issues, and didn’t try to change her. So find your family, and find your healing. It’s amazing to see a female whose characterization began as a blatant parallel with her male counterpart’s, as if to say her experience matters just as much as anyone’s. Pain and struggles have no gender barrier. Neither does the ability to rise above them and come out a hero on the other side. Sara wandered in and out of Starling City unsure of her place and purpose, feeling the need to protect, but also feeling lost and unconvinced that she could use her skills to truly make a positive impact. Sara goes through that all-too-relatable identity crisis of “what am I doing with my life?” The lighter tone of Legends, combined with the direction it gives Sara’s life, has allowed Sara to shake off some of the sadness that weighed her down and blossom into a snarky leader who doesn’t hide behind a mask because the work she does is uplifting. Sometimes, the answer to this universal life question of purpose comes in the form of a man in a trench coat from the future finding you, lying to you, and bringing you on a journey through space and time that changes your life. Sometimes, it takes you searching high and low for a way to put the skills you already have to use in a different way. And sometimes, it boils down to finding that inspiration from someone like Sara, someone to be your flashlight guiding you out of the darkness and convincing you that you are stronger than your past mistakes. Many of us grew up thinking our whole lives were about being perfect. Perfect grades. Perfect job. Being the perfect sister/daughter/friend. But then an undead assassin came along with a reminder that perfection is not always an attainable goal. Humans are not meant to be perfect. Sometimes we keep secrets because we don’t want to face the truth. Sometimes we convince ourselves that self-preservation justifies our actions. Sometimes we find our lives taking paths we didn’t intend them to. Sometimes we have so much confidence in our skills in one arena, but no faith in our personal value. The point of life isn’t to go through it seamlessly without error, because without error, we wouldn’t learn and grow. Sometimes, we screw things up for the better. In discussing Sara’s status as bisexual representation, I could mention how incredible it is to see how unashamed and confident she is and always has been about her sexuality, how refreshing it is to see her sexuality normalized by her peers, and how naturally her attractions have been portrayed regardless of gender. Every one of those statements deserves attention and contributes to a progressive television landscape that teaches acceptance and pride. However, I’d rather shine a positive light on an aspect so often criticized: her lack of labels. Labels are everywhere. Food. Clothing. This article. People. Wait a minute… One of these things is not like the others. I am not advocating for a lack of labels on humans. Labels are powerful. They provide a calming feeling of understanding and self-confidence when you’ve spent days, months, years doubting your perception of yourself while sinking under a wave of spreading insecurities. They connect you to a greater community when you’ve been isolated from everything familiar and comfortable. Given that bisexuals become defined to the outside world based on who they’re currently dating, it becomes important for visibility and preventing erasure to have characters declare their bi-ness. But when it comes to a topic as varied and complex as human sexuality, a single, declarative word may not sit well with everyone it technically describes. Sara represents those who instinctively understand the idea of falling in love with a soul rather than a gender, and labeling yourself anything at all creates a feeling of otherness that clashes with the instinctive understanding. Sara represents those who find the term bisexual too specific because it declares that you are attracted to “this” and “that,” and not feeling an attraction toward someone you “should” reignites the feelings of doubt and fraud you’ve finally managed to subdue. Sara represents those who find bisexual too generic because it does not account for skewed gender attraction or other nuances. Sara represents those who choose not to label themselves just yet because they’re in the midst of discovering and refining their identity. In a community still demeaned and vilified with terminology used to describe their orientation, Sara represents those who’ve had certain words ruined and turned against them, who have a negative memory attached to a descriptor. If Sara, at a future time, decides to pull a Rosa Diaz and unabashedly label herself, then that is just as valuable as the way she currently resonates. About a year after Sara’s return from presumed death aboard the Queen’s Gambit, three arrows to her abdomen sent her stumbling off a building and crashing onto a dumpster to die in a dark, dank, dirty alleyway. Before laying Sara to rest in her formerly empty grave, Team Arrow shoved her body into a freezer while deciding whether or not her death warranted an announcement. Talk about “bury your gays” being a problem; they also equated her death with taking out the trash. Yikes. We still live in a society where minority representation has a major impact on the community, and it probably always will. The minor backlash that shows receive for including LGBTQ characters is far surpassed by the major backlash shows receive when the representation misses the mark, so it’s perplexing that this issue still exists. Granted, Sara was killed prior to what happened with The 100′s Lexa, but still. You wouldn’t write a medical storyline without consulting Gray’s Anatomy (the book, not the show, or maybe both), so why would you write a character from a community without doing the research to understand the potential ramifications. Almost all of the world’s information is accessible with a quick Google search, including a list of tropes, statistics, and previous examples of representation. There are also individuals within the community who can point out issues with the representation, but even if you staff LGBTQ writers, you must also foster an atmosphere in which these writers feel comfortable expressing their opinions and are listened to by their peers. Unless we have the Legends time travel us into the writers’ room, we may never know what factors and limitations contribute to certain decisions, but what is apparent, is that Sara’s death was way more problematic than an issue of representation. I’m not arguing that Sara shouldn’t have died. I certainly would have preferred her to stay alive, but characters die. Straight characters die. Not straight characters die. Death has been and always will be a part of television, especially in series when the stakes are literally life and death, and we have to accept that. What we don’t have to accept are the circumstances – the how and the why. How Sara died displayed irreverence toward one of the few LGBTQ heroes in the DC TV universe, as well as laziness toward a character the show spent a year garnering audience understanding about and sympathy for. We’re supposed to believe that Sara, a trained assassin, was put down without a fight? Hard to do. We’re supposed to believe that after everything Sara made it through, that a little bit of wood and metal took her down. Also not plausible. Then there’s the why of her death bringing up its own issues. A character’s death should tell you everything you need to know about their life. Tommy died saving Laurel, demonstrating his loyalty. Moira sacrificed herself for her children because everything she ever did, right or wrong, she did for the sake of her family. Even Malcolm died protecting his daughter, who he loved in his own way. Sara died in Malcolm’s roundabout attempt to stop the League from hunting him, meaning… she was a pawn? She was unlucky? I don’t have a good answer. Sara was a fighter, a protector, a woman who would do whatever she needed to do to survive. She should have gone out in a way that honored the strength and valiance with which she lived her life. Anything to the contrary misses the significance and importance of this character’s prior development. Since the arrival of Kal-El on Earth, superhero stories have incorporated romantic subplots because they innately add something necessary to the story. The search for love, companionship, a kindred soul is an integral aspect of the human experience and humanizes these characters whose powers and abilities distance them from the audience. When Superman fights for Lois Lane, when Spiderman fights for Mary Jane, and when Wonder Woman fights for Steve Trevor, we understand what they have to gain and what they stand to lose. We understand that their intentions are noble, but also motivated by a universally human desire. In demonstrating that these super individuals are not so different than us, it opens us up to the possibility that we can be super too. Giving Sara a steady love interest this season stands as the series’ smartest move since making her the captain of a time traveling team of misfits. Not only does this storyline contribute to the show’s trend of being unafraid to shine a positive light on minorities presently disparaged for antiquated prejudices or misplaced fears, but it also further fleshes out and challenges a character who had found a certain level of stasis in her personal and professional life. Although Sara’s knight in a polyblend pantsuit has provided aid in a few precarious situations, Sara’s not a damsel. She doesn’t need anyone to save her and sweep her off her feet, but what she does need is a reminder that her worth is not determined by her past darkness. It’s determined by how she has chosen to live from this point forward – as a hero. After Snart died, Sara spent a season not making meaningful connections, content to keep her emotional distance, whether out of fear of getting hurt, ease of focusing her energy on the mission, or hesitance to allow herself a vulnerability as a leader. It was easier to put those feelings in a box, close the box, and lock the box, but Sara’s interactions with Ava highlight the happiness that this mindset kept at bay. The amount of frustrating and heart wrenching it was to see Sara confess to never being this happy and then preventing herself from keeping that happiness shines a light on the bogus concept that you are more or less deserving because of the past, that somehow what you once chose or did negates the possibility of choosing or doing differently in the future. We accept the love we think we deserve, but as Wonder Woman said, “It’s not about deserve. It’s about what you believe. And I believe in love.” Ava allows a character marked by death and sadness to smile, to giggle, to remember that life is not all about loss. We could all benefit from that reminder, that person, platonic or romantic, who without hesitation says we are not damaged. Sara shows us that no matter how broken you feel, how horrible your past has been, there is always hope of it getting better. Often times, the introduction of a character’s love interest can be obvious from the beginning. As soon as Nicole Haught hit on Waverly, it became clear where that was going. Two episodes after Maggie Sawyer showed up at Alex’s alien crime scene, it became clear where that was going. Some viewers jumped on the AvaLance train after the season premiere, but I did not see this coming because they were treated no differently than Kendra and Ray or Amaya and Nate. They were planned, but allowed to develop naturally, to develop as individual women before developing as a couple. When you’ve been conditioned not to have hopes or expectations, even the smallest details can have a major impact. AvaLance is for those blondes who’ve seriously considered dying their hair if ever they fell in love with another blonde because it’s never depicted on TV, so it feels weird and unnatural. AvaLance is for those who have been two regular women on a completely normal first date. AvaLance is for those who came to terms with themselves alongside Alex Danvers and now need a reminder about their potential for happiness. It’s weird to realize you’ve invested so much time and thought and emotion into a person who a group of writers created and shaped to earn their paycheck, but when you invest in a fictional character, you invest in a part of yourself. Sara might not be your type of representation, and that’s okay. I just hope she teaches you that your flaws don’t make you any less deserving. They make you more you, and you are wonderful. 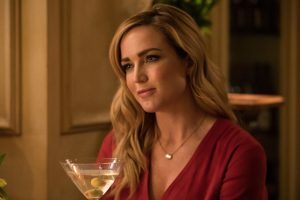 Amidst all of the crazy, all of the episode concepts that feel like they were created through a game of Mad Libs, the beauty of Legends of Tomorrow is that regardless of your gender, race, religion, sexual orientation, or superpower status, you can be a hero. The Season 3 finale of DC’s Legends of Tomorrow airs tonight (April 9) at 8PM ET/PT on The CW. Take a look at some season finale photos here! Stephanie Hall is a former competitive gymnast and current competitive Jeopardy watcher. Having earned an MFA in writing and producing for TV from Loyola Marymount University, Stephanie aims to create and review content that inspires creativity and a sense of purpose. Her favorite series include Fringe, Outlander, Supergirl, and pretty much anything with a female action hero. You can follow Stephanie on Twitter @_stephaniehall.